Students in Professor Anne McClanan’s art history seminar in winter 2015 prepared a digital and physical exhibit of Portland State University Library’s first acquisition of a complete medieval manuscript, a Book of Hours from fifteenth-century Paris. The physical exhibit is showing on the first floor of the PSU Library May 4-July 17, 2015. The podcasts and essays linked below explore the history, meanings, art, and materials of medieval devotional manuscripts such as the PSU Library’s Book of Hours. 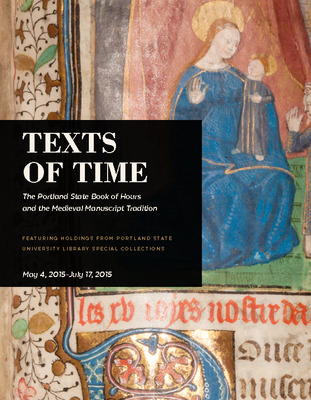 This is the catalog for the exhibit "Texts of Time: The Portland State Library Book of Hours and the Medieval Manuscript Tradition"
Shirleanne Ackerman Gahan discusses patronage and ownership of Books of Hours and explores evidence within PSU’s book that suggest information about its possible owner or owners. Melissa Medefesser analyzes key features of illustrations in the Book of Hours indicating regional styles and artistic innovations of its time. Kenna Miller presents her findings on the chemical analysis of pigments used in Portland State’s Book of Hours. Matthias Bladou describes the use of Latin and vernacular French in the Book of Hours, and how language reflected a more personal use of prayer texts in the fifteenth century. Thomas Goodwin describes the types of manuscripts that preceded Books of Hours, their commonalities and distinctions, and the changes in content and design of devotional manuscripts over time. Devin Courtright discusses William Caxton's (1415-1492) place in print history. Bethany Kraft analyzes the dress worn by religious figures and laypeople depicted in the illuminations in Portland State’s Book of Hours. Jackie Anderson explains the importance of devotional books in medieval life and describes the significance of color and symbol in the marginal illustrations and illustrated initials on a fifteenth-century manuscript. Charolette Stoehr describes the points of difference and continuity amongst Book of Hours. Caitlyn Au describes the use and meanings of the medieval arch shape as a frame for displaying illuminations within niches and through symbolic gateways. Tammy Boyer-Martel focuses on how the Book of Hours provides crucial resources of cultural context that reveal the intimate and personal relationship between text and owner.